Twenty acres of grapevines grow on the steeply terraced terrain of Lucchesi (loo-kay-zee) Vineyards & Winery. From here, visitors admire a scenic vista of the majestic Sierra Foothills. It is evident why Mario and Linda Clough named this their View Forever Vineyard when they decided to grow grapes here just 10 years ago. But the beauty of this pristine spot is not limited to its views. There’s also beauty in watching the grapes, planted to maximize their southwestern sun exposure and ideal ripening conditions, develop. In fact, many contend that some of the region’s finest grapes grow on the Lucchesi estate. Mario feels lucky to have the help of Matt Wentz, his longtime vineyard manager and winemaker, who managed to graduate from UC Davis with a degree in viticulture and enology in 2009 while keeping his job. Matt claims that his young career in viticulture has certainly seen its share of trial and error, but he seems to have a knack for it. One of his first major jobs was to graft many of the vines over to desired varieties. He added five Port varieties, Pinot Grigio, Sauvignon Blanc, Petit Verdot, and Petite Sirah. 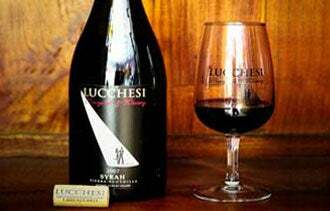 For a winery that has been making wine for less than a decade and a winemaker whose diploma is barely dry, Lucchesi has garnered an impressive number of awards. For starters, both the 2006 Cabernet Sauvignon and 2006 Syrah won Double Gold and Best of Class at the El Dorado County Fair, the 2007 Red Port won Silver at the San Francisco Chronicle Wine Competition, and the 2009 Chardonnay earned 93 points in a Tastings.com review. Visitors to Grass Valley have two opportunities to sample Lucchesi wines. They can either call ahead and make an appointment to visit the winery itself (it’s just a few miles outside of town), or stop into the downtown tasting room next to the Del Oro Theater during regular hours. Either way, they are certainly in for a memorable experience.